I made a mistake by leaving out a CUP OF FLOUR! Oh miss Kelsey, your photos are always so gorgeous! Do you use the auto setting or manual? And did you take a class to get so good? All I know is that my photos always come out blurry or grainy or… well, sub-par in comparison! I think these still look absolutely delicious! Even if they didn't rise properly, I'm sure they still tasted good! ;) Also that comic totally made me lol! My blueberry muffins tasted good last weekend, but I forgot the egg (or flax egg) and they did not rise like I wanted. So frustrating, but your look good! Those cartoons are the cutest! For me, looks don't matter as much as taste. I'd rather something taste better than it looks, than look better than it tastes. That's why baking scares me, one wrong measurement and everything goes wrong. With cooking, you don't need to be as precise. Okay, so it didn't rise, but did it still taste good? omg!! I love you , you muffin maniac!!!!!!! These still look damn good to me!!!!!!!! I have left out important ingredients for things I baked before too, WOOPS!!!!!! Love you! Cant wait for the recipe for these! That cartoon is hilarious! I wouldn't mind if all of your posts were written in cartoons! I don't have a problem with leaving things out of recipes by accident as much as I do on purpose :P I'm always switching ingredients or adding things. Well, my muffins never looks that fluffy ;). Yours looks delicious. Can't wait for the recipe hehe. 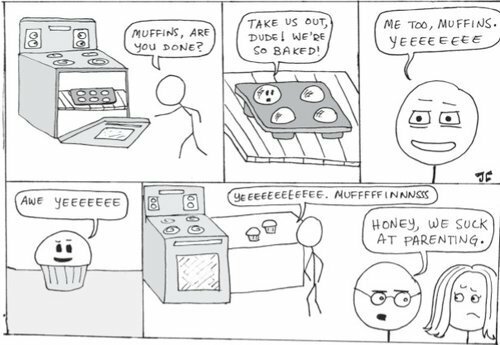 I agree that muffin still looked really yummy. bahahahahahahaha i love that cartoon at the end. and even though your muffins didn't rise, they still look delicious! !